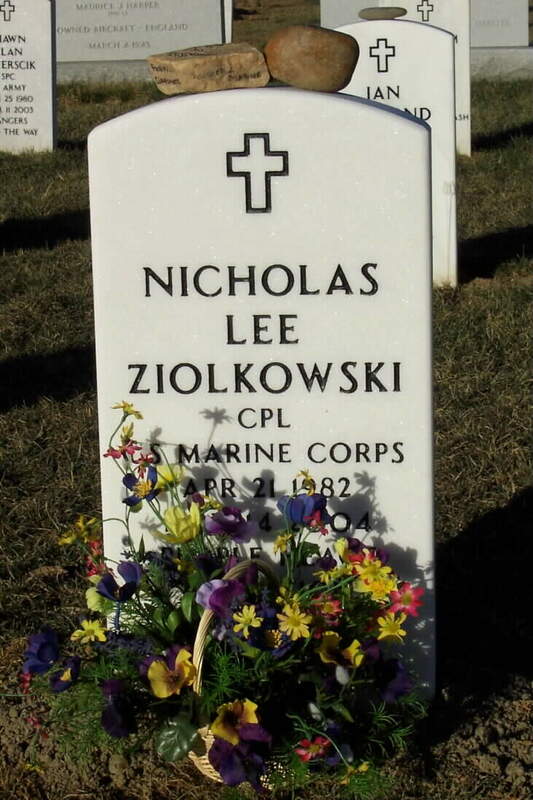 Corporal Nicholas L. Ziolkowski, 22, of Towson, Maryland. He was assigned to 1st Battalion, 8th Marine Regiment, 2nd Marine Division, II Marine Expeditionary Force, Marine Corps Base Camp Lejeune, North Carolina. For further information contact the 2nd Marine Division Public Affairs Office at (910) 451-9033. Tracy Miller, worried about her 22-year-old son fighting in Fallujah, told his former high school history teacher Friday that she appreciated his prayers. Yesterday morning, family friends received an e-mail from Miller with the subject line "worst possible news." "Two Marines came to my door last night to tell me Nick had been killed," the Towson University English professor wrote. Marine Corporal Nicholas Lee Ziolkowski of Towson, a 2001 graduate of Boys' Latin School, became the 17th person from Maryland to die in fighting in Iraq, and the third in less than a week. The others are Marine Lance Corporal David M. Branning, 21, of Cockeysville and Army Specialist Thomas K. Doerflinger, 20, of Silver Spring. Department of Defense officials announced last night that Ziolkowski had died but did not say when or where. Ziolkowski was a team leader and scout sniper, said his family members, who gathered yesterday at his mother's Towson home. They said they did not know the details of his death, but they believe he had led his squad into heavy combat several times in Fallujah before he was lost. Family and friends remembered Ziolkowski as an intensely patriotic young man, one who began planning for his military service in ninth grade and left for active duty in the Marines the morning after high-school graduation. They said he firmly believed he could help make the world a better place. "He loved his country more than any person I know that age," said Baltimore City Councilman Keiffer J. Mitchell Jr., who taught Ziolkowski and his older brother Peter U.S. history at Boys' Latin. "I don't think I could be any prouder of Nick." In a written statement, Miller described her son as "charismatic, caring and sensitive, making friends wherever he went." Ziolkowski's father, Andrew, said in the statement that his Captain "wanted 10 more guys like Nick." Ziolkowski ran several miles every day and worked out constantly to get in the best shape possible for military service, his family said. At 17, he completed the Navy Seal Odyssey program, the 24-hour version of the Navy's "Hell Week," according to the family's statement. He finished in the top 10 among several hundred participants and was the youngest finisher. According to the Department of Defense, Ziolkowski was assigned to the Camp Lejeune, North Carolina-based 1st Battalion, 8th Marine Regiment, 2nd Marine Division, II Marine Expeditionary Force. Ziolkowski and his close friend, fellow Marine Mark Engel, dreamed of coming home safely together and opening a surf shop in Cancun, according to the family. That dream was shattered in July when Engel, a Colorado resident, died of wounds received in Iraq's Anbar province. Ziolkowski was scheduled to return home in February, and he planned to attend college at Towson University, the family said. At Boys' Latin, Ziolkowski was captain of the cross-country team his senior year, said Leslie Heubeck, a school spokeswoman. After graduation, he often returned to Boys' Latin in uniform to speak to students taking military history classes. "I let him teach the whole class," said military history teacher Butch Maisel. "The kids were spellbound. ... He really seemed to love what he was doing." Maisel said he has fond memories of Ziolkowski as a student who always sat in the front row "within striking distance, I used to tease him," Maisel said. "He was like that -the kind of guy you could tease and he'd go right along with it." At a school where most students go on to college immediately after graduation, "people respected his decision to join the Marines," Maisel said. "When he came back, he always drew a crowd." Ziolkowski's family, which includes two brothers and a sister, said he will be buried November 24, 2004, at Arlington National Cemetery. The family will receive visitors from 11 a.m. to 4 p.m. today through Thursday at 8221 Ruxton Crossing Court in Towson. Corporal Nicholas L. Ziolkowski joined the Marines right out of high school, firmly believing he could make a difference. He had been planning his military career since ninth grade, his mother recalled, running several miles a day and "working out constantly." He had been in Iraq since June, and was due to return to the United States in February. But on Sunday, the 22-year-old from Towson was killed in fighting in Fallujah, the Department of Defense said Monday. He was the third GI from Maryland to be killed in combat in Iraq in four days. He was assigned to the 1st Battalion, 8th Marine Regiment, 2nd Marine Division, II Marine Expeditionary Force, Marine Corps Base Camp Lejeune, North Carolina. Ziolkowski joined the Marines in 2001, shortly after graduating from Boys' Latin School, his mother, Tracy Miller, said Monday night. He hoped to study history at Towson University, where Miller works. Ziolkowski "was charismatic, caring and sensitive, making friends wherever he went," his mother said. At age 17, he took part in the Navy's Odyssey SEAL Adventure Challenge, becoming the youngest person ever to complete the grueling 24-hour version of the SEALS' "hell week," his mother said. His father, Andrew Ziolkowski of Germantown, said in a statement that his son's commanding officer "wanted 10 guys like Nick." Miller said she last saw her son at Camp Lejeune shortly before he was deployed to Iraq. She last spoke with him on November 5. "We talked about the courses he was going to be taking at Towson," she said. "I didn't want to say stuff like 'be careful,' so I didn't." Miller sent her son an e-mail on November 11, but "I don't think he got it," she said. She said she received word of her son's death about 7 p.m. Sunday, but that the Pentagon had no details about how he was killed. 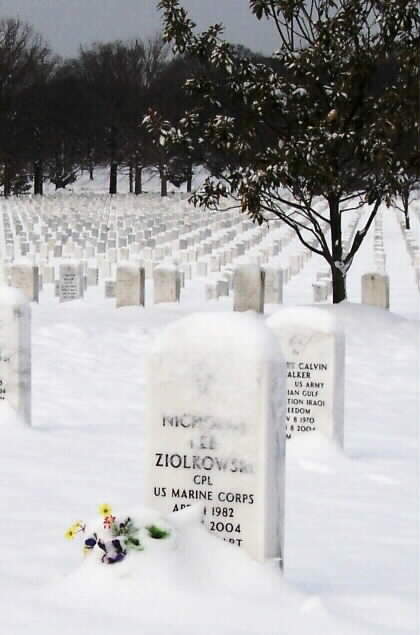 Ziolkowski will be buried at Arlington National Cemetery on November 24, 2004. Besides his parents, he is survived by two brothers, Peter and Alex, and a sister, Julia. 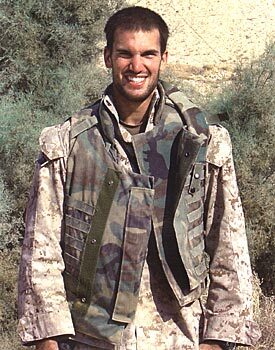 On November 14, 2004, during combat operations in Fallujah, Iraq, CORPORAL NICHOLAS L. ZIOLKOWSKI, USMC, was killed by enemy fire. Nick is the loving son of Tracy Miller and Andrew Ziolkowski and his wife, Lydia Scaletter; beloved brother of Peter, Alex and Julia Ziolkowski; dear grandson of Stephanie Miller; fond brother-in-law of Kristina Ziolkowski; uncle of Madeline Nicole Ziolkowski. Also survived by aunts, uncles and cousins. Funeral Service will be held at the Old Post Chapel on Fort Myer on Wednesday, November 24, 2004 at 10:00 a.m. Traffic guide at gate will give directions to Old Post Chapel). Interment Arlington National Cemetery, Arlington Virginia 22211. Those desiring may make contributions to the "Nick Ziolkowski Scholarship Fund", c/o Boys Latin School of Maryland, 822 W. Lake Ave., Baltimore, Maryland 21210. 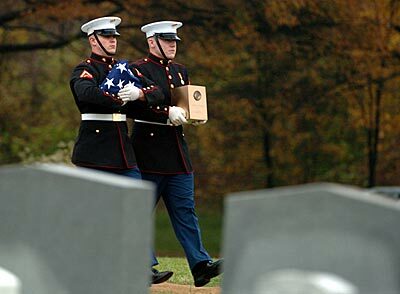 Hundreds Mourn Marine From Md. Tracy Miller thinks about her son's touch and his voice, trying to grasp that she will never experience either again. She wakes up in the morning and cries for her "Nicky," Corporal Nicholas Lee Ziolkowski, 22, of Towson, Maryland, who family and friends say was greatly admired for his charismatic personality, intelligence, clarity of purpose and ambition. Yesterday, under a colorless sky and a light rain, Miller, 54, watched as her son was buried at Arlington National Cemetery. 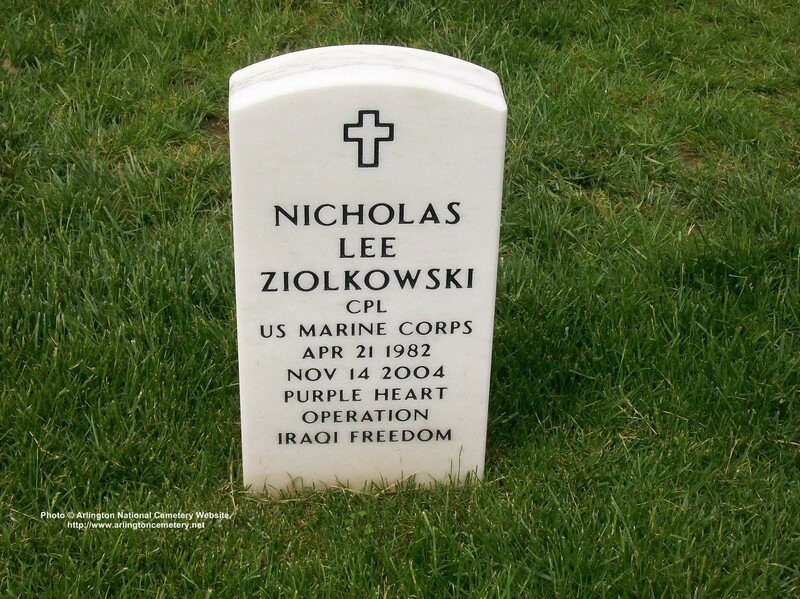 Ziolkowski was killed November 14, 2004, in Al Anbar province, Iraq, while his unit was fighting in Fallujah, according to officials with the 2nd Marine Division public affairs office. He was shot in the head by an enemy sniper he was trying to kill, his mother said. Ziolkowski was the 95th service member killed in Iraq to be buried at Arlington. 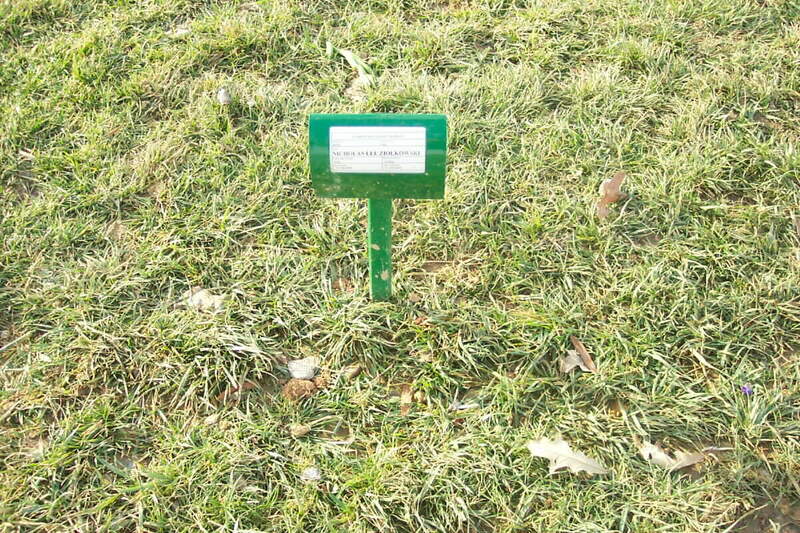 His cremated remains were interred in the cemetery's southeastern corner. A shelter set up over the gravesite wasn't big enough to hold the hundreds of mourners who came to pay their respects yesterday. So they held umbrellas and stood quietly where they could -- on the grass, in the mud, on top of surrounding gravesites. There were relatives and friends; faculty members, classmates and parents from Ziolkowski's alma mater, Boys' Latin School in Baltimore; fellow Marines; and students, faculty members and staff members from Towson University, where Miller works as an administrator and part-time instructor in the English Department. The funeral was preceded by an interfaith service at the Old Post Chapel at Fort Myer. The Rev. Paul Collinson-Streng, Lutheran campus pastor at Towson, described Ziolkowski as a charismatic, caring, sensitive man who made friends wherever he went. He recalled Ziolkowski's courage and selfless acts, including once picking up strangers stuck at a bus stop in the rain shortly after receiving his driver's license. "He would get in trouble in order to get a friend out of trouble," Collinson-Streng said. Ziolkowski was assigned to the 1st Battalion of the 8th Marine Regiment, which is part of the 2nd Marine Division, 2nd Marine Expeditionary Force, based at Camp Lejeune, N.C. He joined the military after graduating from Boys' Latin School in 2001, Miller said. Growing up, Ziolkowski struggled with learning disabilities, including dyslexia, Miller said. He was in the ninth grade when he decided that he wanted to be a Marine and began training immediately, running and lifting weights every day. "He was just real clear -- the reason he was so envied by the other kids, he seemed so clear about what he wanted to do," said Ab Logan, who taught Ziolkowski English his senior year. "They didn't want to be Marines, they just wanted to be Nick." Ziolkowski developed a passion for surfing and talked of opening a surf shop in Cancun, Mexico, with a close friend and fellow Marine, Mark Engel. But Engel died in Iraq this summer, and Ziolkowski decided to pursue his interest in teaching history and serving as a mentor to students who "were as lost as he had been," his mother said. He planned to leave the military and enroll at Towson University next year. In addition to his mother, survivors include his father, Andrew, of Germantown; two brothers, Peter, of Towson, and Alex, of Germantown; a sister, Julia, of Germantown; and a grandmother, Stephanie Miller of Baltimore. Ziolkowski died without having met his month-old niece, Madelyn Nicole, Miller said. He had agreed to be her godfather. Out of her son's death comes a mission for Miller, who describes herself as antiwar. She said she wants to help people understand that U.S. troops fighting in Iraq are not machines. "These are human beings: They have lives. They have families. They had hopes and aspirations," she said. "And in Nicky's case, the world is so much worse off because he's not here." Last week’s vigil and funeral service for Nicholas Ziolkowski wasn’t about his untimely death in a far away war. It was an affirmation of life and a prayer for peace. Approximately 150 community members lit candles on Newell Field to remember Ziolkowski, who was killed in Fallujah, Iraq on Sunday, November 14, 2004,. On Wednesday several hundred mourners gathered at Arlington National Cemetery for a funeral service. Ziolkowski, 22, lived in Towson and planned to enroll at TU next fall. His mother, Tracy Miller, plans to return to work at Towson today. She is the University’s director of retention and the National Student Exchange, and serves as a part-time faculty member for the English department. “Nick used to say, back in middle school, that he would live in the Residence Tower when he came here, but he promised he would come home for dinner every night,” Miller recalled during her remarks at the vigil. On Wednesday the Old Post Chapel at Fort Myer overflowed with friends and loved ones. Rev. Paul Collinson-Streng, the Lutheran Campus Pastor at Towson University, offered the homily. Miller said she was grateful that the community had “wrapped its arms” around her family. “I have been just so overwhelmed, in a good way, by the outpouring of love and support, for me as well as for Nick,” she said. Light rain did not deter community members from attending Monday’s vigil. Jennifer Gordon, director of programs for the office of diversity resources, said she was heartened by the turnout. Rep. Dutch Ruppersberger said he would never forget Ziolkowski’s contribution. “It takes a special person to sacrifice their life for their country. We must acknowledge the contribution our young men and women are making over there,” he said. District 42 Senator James Brochin, an adjunct professor at Towson, echoed those sentiments. Several of the speakers at the vigil voiced their opposition to the current conflict in Iraq, during their remembrance of Ziolkowski. One attendee carried a sign that read “War is not the answer,” while several speakers offered prayers for peace. Political ideologies aside, the participants respected Ziolkowski’s courage and Miller recalled why her son decided to join the Marines. “He said ‘Mom, look around you. This is so beautiful. I want to help preserve this for my children and grandchildren.' Well he won’t have any now,” she added. 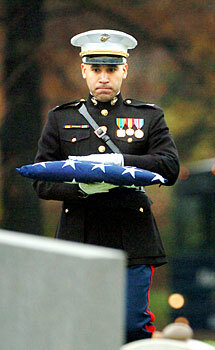 The gods wept for Tracy Miller when she buried her 22-year-old son at Arlington National Cemetery November 24, 2004. It was the day before Thanksgiving, and a light rain had started long before dawn. It fell on the 150 or so mourners who had to wait outside Fort Myer's Old Post Chapel at Arlington during the 10 a.m. service for Marine Corporal Nicholas Lee Ziolkowski. Busloads from Boys' Latin, where Nick Ziolkowski attended high school, and Towson University, where his mother works, helped pack the chapel to the point where even standing room had no room. 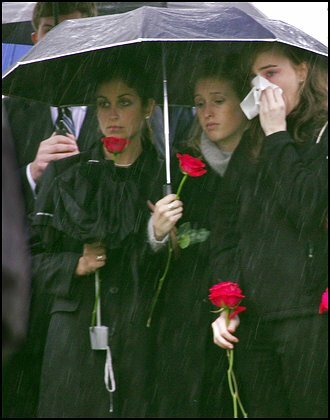 At the graveside ceremony afterward, the rain came down harder and beat on the umbrellas like a distant tattoo. Towson resident Miller, a popular adviser and English teacher at the university who was working there before Nick was born, had been looking forward to February, when her younger son Nick was expected to enroll there. He was proud of his Polish heritage, Miller said. During World War II, his grandfather had been in the Polish cavalry, the troops on horseback who made a heroic but futile attempt to fight off the Nazis. Nick loved the Marine Corps. He had wanted to become a Marine since the 10th grade, she said. He had joined the corps the day after he graduated from Boys' Latin in 2001. That was tough on Miller, an avowed pacifist since she was in high school in the 1960s. She had to be guarded in her remarks. When Nick came home on leave from Camp Lejeune, he often would bring along fellow Marines who lived too far away to get to their own homes. After Miller took part in a large protest in Washington in June 2002, she returned home to find Nick and seven of his buddies littering the floor and watching "The Simpsons" on television. When they asked about the protest, she checked her feelings. "I knew I couldn't say anything that would make them hesitate instead of acting quickly," she recalled. She overheard one ask Nick if he could kill somebody. "I hope I don't see somebody who has a mother," Nick replied. They were depersonalizing it, said his mother. "They didn't want to think of them as people." Before Nick signed up, he figured he'd be with the Marines for 20 years, retire and then do something else, she said. But he was chafing under the corps' restrictions. He was given to discussions about philosophy and religion, and dreamed of opening a surf shop with fellow Marine Mark Engel from Colorado. Nick had come to realize that the Corps would have too great a hold on his time. "I feel I have this chain yanking me back when I want to do something," Nick told his mother when she visited him at Camp Lejeune, and she had the luxury of spending three uninterrupted hours with him walking the beach. He wanted to study Polish, and he had asked her about taking classes abroad through the university. 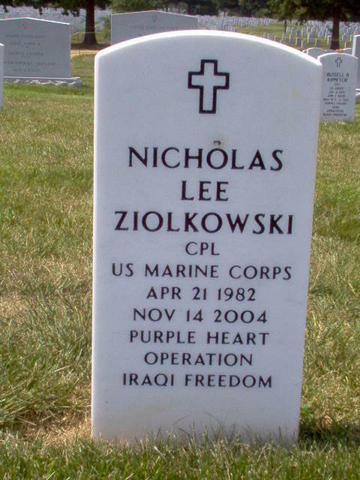 But on November 14, 2004, Corporal Nick Ziolkowski was killed in Iraq during the battle for Fallujah. His surfing buddy, Mark, was already dead. Nick, who was a sniper, was killed by the sniper he was trying to kill, according to his Captain. He had taken his helmet off to see better, Miller was told. But she was also told it probably wouldn't have mattered if he had had the helmet on. During Nick's funeral, after the crowd parted to allow two Marines in full dress uniform to carry a folded American flag and a square bronze urn bearing Nick's ashes to the front of the chapel, Nick's father, Andy Ziolkowski of Germantown, spoke eloquently, and with humor. "Nick is probably surfing on the waves in heaven with Mark," he quipped. He said Nick was charismatic, he made friends wherever he went, and he was caring. He was the kind of kid who shortly after he got his driver's license stopped in the rain at a bus stop to give people he did not know a ride. And he read from an e-mail the wife of Nick's Captain had posted after she received the overeseas phone call in the middle of the night telling her that Nick had died. The captain's wife, who is pregnant with their first child, knew the families of many of the Marines. She was writing the e-mail late into the night, she said, because it was so important to her husband that Nick's family know about him. The captain asked his wife to tell Nick's family that the young Marine was happy and excited to be going into battle. He was a joy to lead, and he was a leader himself who took good care of his team, the captain said. Nick did not die alone. Dominic Esquibel, who was with him when he died, had been to Miller's house several times, Nick's mother said. "He was older than Nick, but he looked up to him." Miller has learned that Nick was an inspiration to many people, from the lower classmen at Boys' Latin to the other members of his squad, she said. The captain had him train newcomers because he was supportive and patient. In a sea of blacks and neutrals at the funeral service, Tracy Miller stood out in a bright pink sweater „ in deference to Nick, she said. "It was intentional. Nick cared a lot about how I looked. He would ask me if I was still going to Curves and still working out. I wanted to try to look good. "But there was no joy in it. I don't believe it, that Nick is surfing in heaven," she said. It was the first time she had seen Arlington, where 25 to 27 funerals are conducted each weekday at the 624-acre cemetery with more than 290,000 grave markers. "There were just fields and fields of crosses and monuments," she said. She has been heartened by the outpouring of love and affection for Nick, for her and for the rest of her family. Miller intends to write a book. It would include a profile of Nick - his life, his aspirations and how he changed the lives of others. She would like to have other mothers write about the children they have lost to war. "I think the world needs to realize that they are people, not machines," she said, "that they laughed and they cried and they had dreams and aspirations and friends, and they got drunk on weekends in high school, and they rose beyond it. "Nick wanted to make the world a safer and a better place." In the face of grief, people have asked what they can do, Andy Ziolkowski said during the funeral. There is something they can do, he said. "They can set an extra place at the table and never forget the sons and daughters who have made the ultimate sacrifice - and always, always give thanks." I would like to personally extend a very sincere and heartfelt thank you for the wonderful tribute you have provided on the web site for Nicholas Lee Ziolkowski. As his father, I mourn the loss of this wonderful young man, as do obviously his mother and the rest of the family. I try to visit Nick every Friday when I travel down from home to work in Clarendon, Virginia. It's sad to see how the row in which Nick is laid has filled up so quickly. I am totally against the war, and have been from the very beginning. But, at the same time I have great respect for our men and women who have responded to the call of their Commander in Chief honorably, and mostly without question. Please keep up your excellent work, and may you and your family be rewarded a hundred fold for your fine work. PS: I've attached a photo of Nick that was taken by Ash Gilbertson of the New York Times. According to Dexter Filkins, the New York Times correspondent, this was the last known photo of Nick prior to his being killed that same day. Nick is the one closest to the front. His close buddy Dominic with the glasses arrived at Nick's side shortly after Nick passed away. flag at Arlington National Cemetery in Virginia. What price death in a war of choice? The Pentagon last week proposed a new answer to one of America's most odious questions. Bowing to pressure from legislators and families who've lost loved ones, the lump-sum payment to a fallen soldier's beneficiary — inelegantly known as a "death gratuity" — would rise from $12,420 to $100,000 (all figures U.S.). But barely had the plan been aired at a congressional committee when it was mired in controversy. Military families and some uniformed officers accused the Pentagon of creating two classes of soldiers because the enhanced payouts would apply only to those who lost their lives in combat zones. Should a mother lose a son in a training exercise at Fort Hood, Texas, the smaller payment would still apply. Said General William Nyland, Assistant Commandant of the Marine Corps: "For me, if a young man or a young lady steps forward and raises his right hand to serve this great nation, I think we have to be very careful about making any distinctions about the type of service that they rendered." The $12,420 payment, as meagre as it may seem, is twice as much as what was paid to families who lost spouses, sons or daughters, mothers or fathers only a year ago. "Someone loses their life serving our country — it is a paltry, miserly and indeed, in my view, insulting amount," said George Allen, a Republican senator from Virginia. The Pentagon proposal is, in part, a reaction to the fact that families of those dying in wars sparked by the Sept. 11, 2001, terrorist attacks were receiving a fraction of the average $2 million paid out by the government to those who lost loved ones in the attacks. Under the proposal, life insurance benefits paid out on death would also jump, to a maximum of $400,000. The plan would be retroactive to October 2001, when the first U.S. soldiers were dispatched to Afghanistan, and would cover more than 1,430 Americans killed in Iraq and the 156 who've died in Afghanistan. The retroactive payments would total an estimated $280 million. Affected families reacted to the proposal with mixed emotions — many acknowledging the money would be needed, many more suggesting that no payout could ever replace their loss. "Part of me thinks, `Good, I'm glad because there are certainly people who desperately need that money,'" says Tracy Miller of Baltimore, whose 22-year-old son, Marine Corporal Nicholas Lee Ziolkowski, was killed by sniper fire in last November's battle for Falluja. "But it doesn't make up for the loss of my son, not for me, not for the world. "He would have made such a difference." Miller, a strong opponent of the war, adds: "Part of it feels like blood money." When her son was buried at Arlington National Cemetery in November, hundreds came to pay respects, far too many for the shelter set up over the gravesite on that rainy day. Her son was immortalized in pictures and words in a New York Times report by Dexter Filkins, who was embedded with the Marines in Falluja. Filkins called Ziolkowski "tall, good-looking and gregarious," one of the company's most popular soldiers and a young man with a passion for surfing. 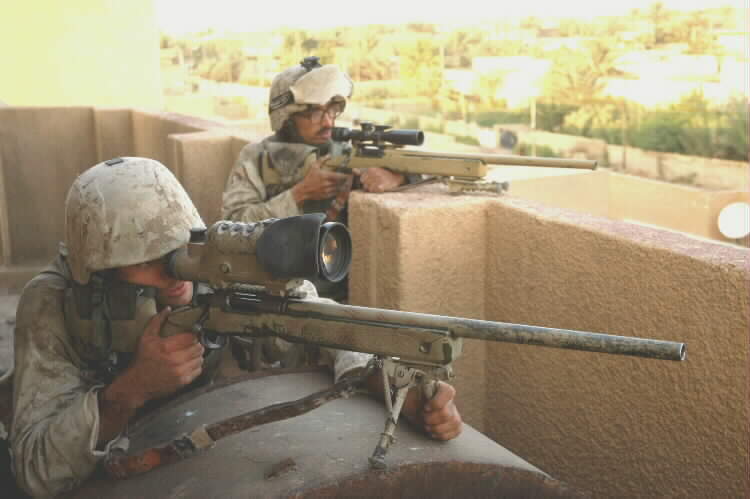 Filkins also wrote about Ziolkowski's penchant for removing his helmet to get a better look through his scope, looking for snipers trying to take out Marines in the street-to-street Falluja combat. 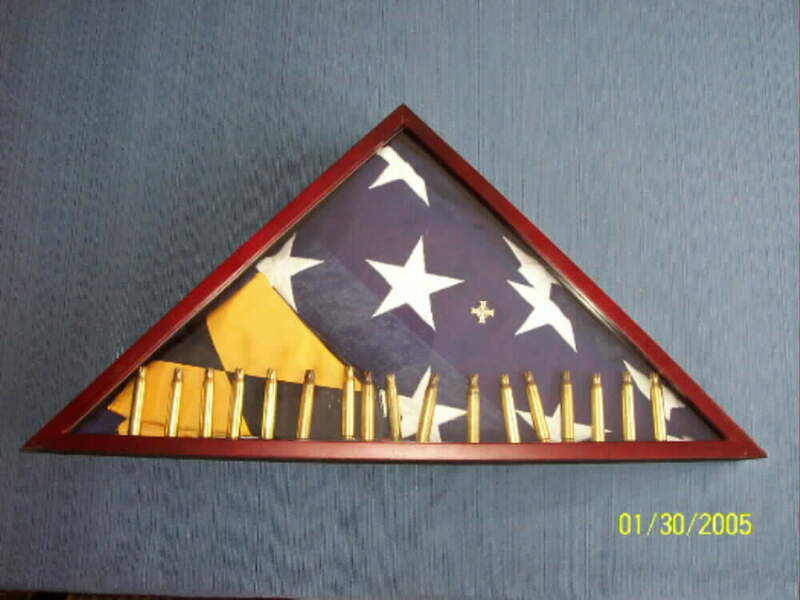 "The bullet knocked Corporal Ziolkowski backward and onto the roof," Filkins wrote. "He had been sitting there on the outskirts of the Shuhada neighbourhood, an area controlled by insurgents, peering through his wide scope. He had taken his helmet off to get a better view. The bullet hit him in the head." Miller takes some solace that her son died instantly, that he died doing something he cared about and that he was killed by the enemy, not in an accident or by friendly fire. The 54-year-old administrator and instructor at Towson University has been anti-war since the Vietnam era but felt her son would receive some much-needed discipline when he signed up for the military before the 9/11 attacks. "Iraq is so wrong, so wrong," she says. "We have no business being there. When he went into Iraq, I felt completely helpless. "When he was killed in November, I was beside myself. "And when we got that death benefit, I thought it was a result of Nick being wise beyond his years."